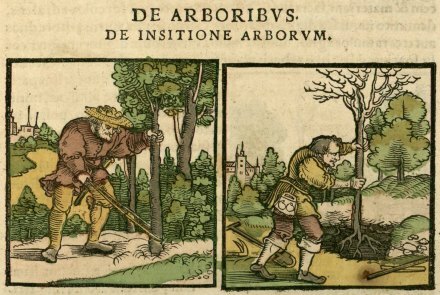 These illustrations are from Botanicon, plantarum historiae written in 1565 by Adam Lonicerus. Lonicerus (1528-1586) was from Germany and was a respected author, publisher, physician and involved in some government matters. Like most Medieval figures I’ve studied; who were authors, they were members of several other professions. These 3 illustrations were taken from the book I came across on a French site; SCD ULP Digital Documents. How I found this page is another one of those “Don’t ask me how I found this” type of deals. 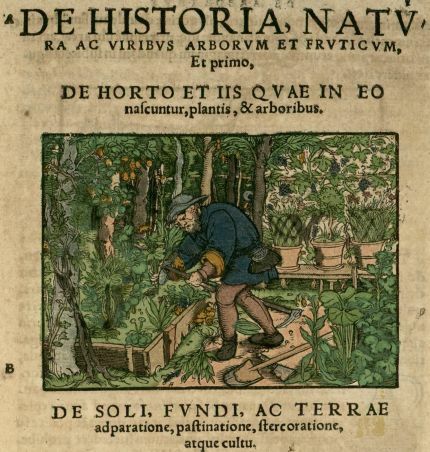 The above is a beautiful illustration of a gardener working in a raised bed, notice the potted plants behind him, and the fruit trees(apparently) right behind the raised bed. 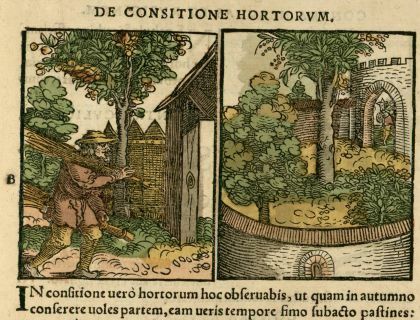 I must confess his skills are beyond what I thought were normal horticulture practices in 1565. The tools are not much different from today’s tools, in style-the materials are obviously different, notice the tool pouch on the belt? A truly fascinating look at 16th ca. horticulture. My Latin is a little rusty 🙂 but I see the root word arbor here and there are trees in the photo’s so we obviously looking at some tree(arbor) practices. I’m not sure if that is a strap(on the left) to pull up the tree or if it is some kind of cutting tool. Looks like a bare-root planting on the right. I noticed that the tree was defoliated when moved which is still a practice done today when transplanting bare-root stock. The great thing I noticed in this illustration is the enclosed garden on the right. Seeing this garden in a 16th ca. book begs me to bring up another point. Everything I had read concerning gardening at this time spoke of all gardens being very symmetrical. There is nothing symmetrical about the garden in this illustration. Is this some sort of kitchen garden? A nursery? A area to experiment with new plants? Something else? Or, I just don’t know what I am talking about? This really has me stumped. Lonicerus was German and spent most of his life in Frankfurt, was this style atypical of the Frankfurt area? More questions then answers . . .Maybe these practices had something to do with the University of Mainz, where he spent part of his career. I understand he also co-authored a book on the plague. Books on the plague and horticulture, I’d say that’s a pretty diversified fellow. Beautiful illustrations in a mid-15th ca. book and more questions than answers when it comes to the horticultural practices shown here. I need some Latin translated . . . any takers. I should also ask if they had seen anywhere in print a translation of this book? Why am I thinking this is beyond a long shot?